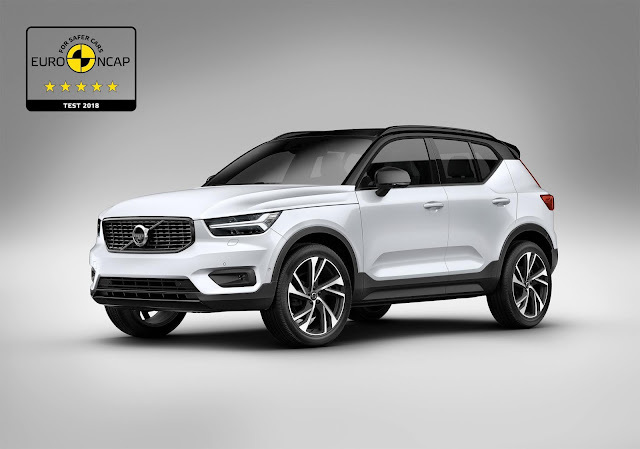 New Delhi, 18 July, 2018: The Volvo XC40 has received five stars and top ratings in its 2018 Euro NCAP tests, joining larger siblings XC60 and XC90 as one of the safest cars on roads. The 2018 Euro NCAP testing was tougher than before, with new and more demanding challenges on safety technology, including cyclist-detection with auto-brake and emergency lane keeping systems. Overall, the new XC40 received the highest safety score among all cars tested under the new regime. The XC40 comes standard with the largest offering of safety technology of any small SUVs, helping drivers detect and avoid collisions, remain safely in their lane and reduce the impact of accidentally running off the road. All tested Volvo cars on sale today have received five stars in their respective Euro NCAP assessments. Last year, the XC60 was crowned the overall best-performing large off-roader and the best overall performer in the prestigious Euro NCAP 2017 Best in Class safety awards. The XC90 received the same accolade in 2015. In March this year, the XC40 was named 2018 European Car of the Year. It is the first Volvo to win the prestigious award, and has been one of Volvo’s top sellers ever since. The company announced in May that it would expand production in its manufacturing facilities in both Europe and China to meet the growing demand for the new car.